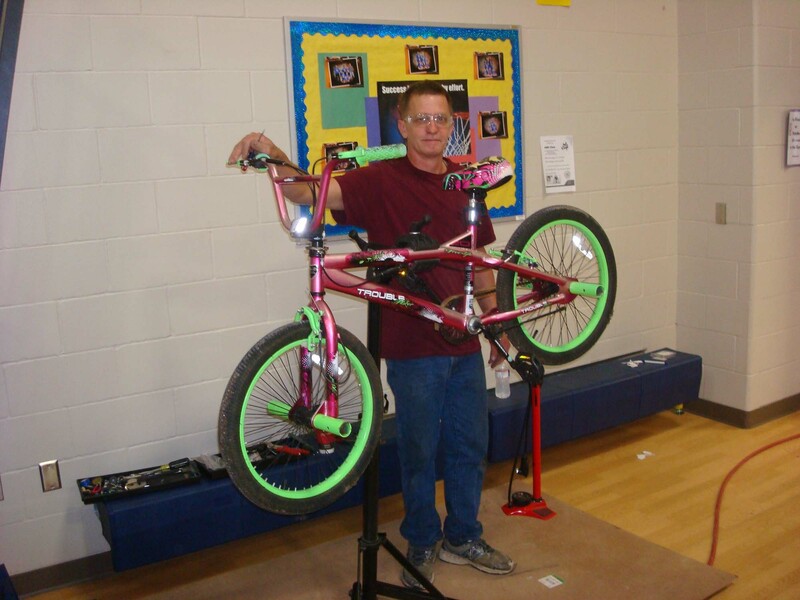 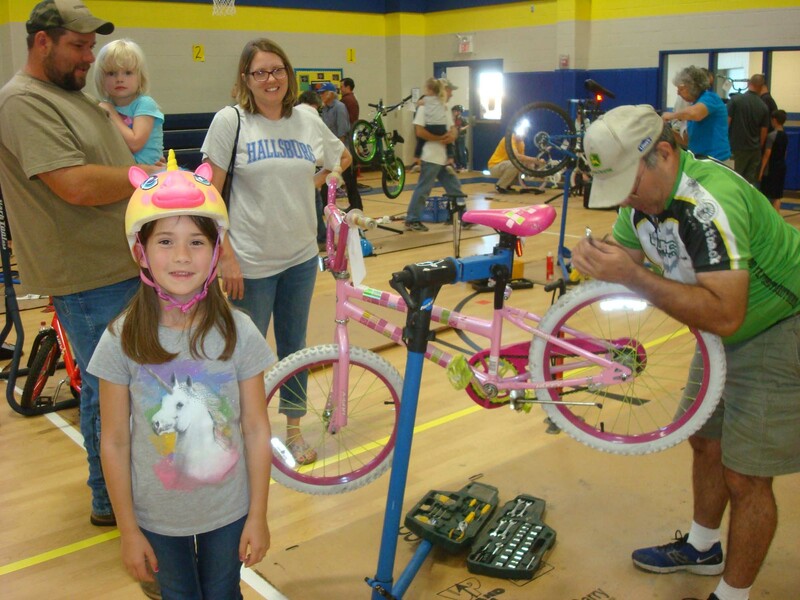 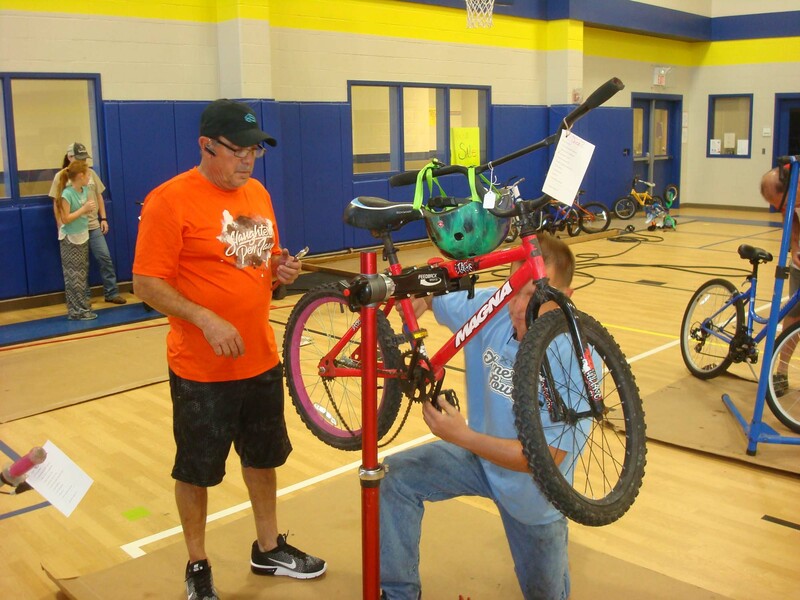 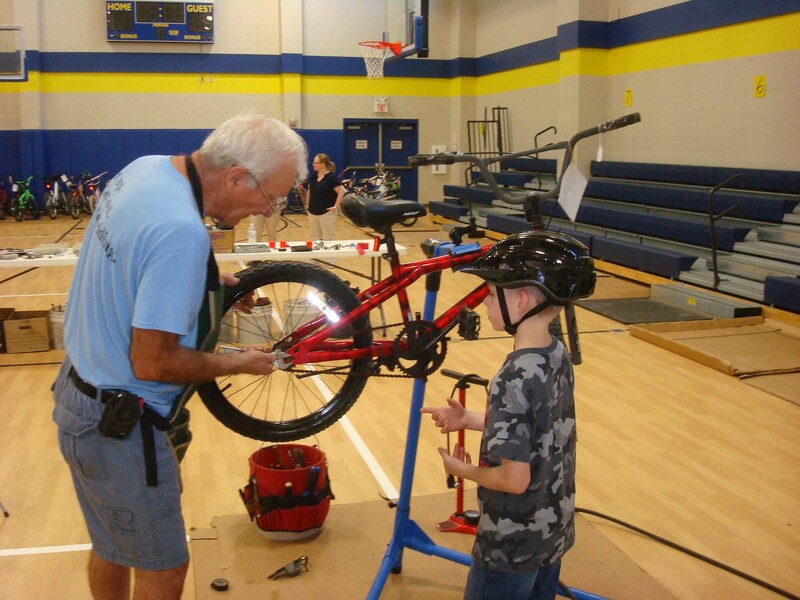 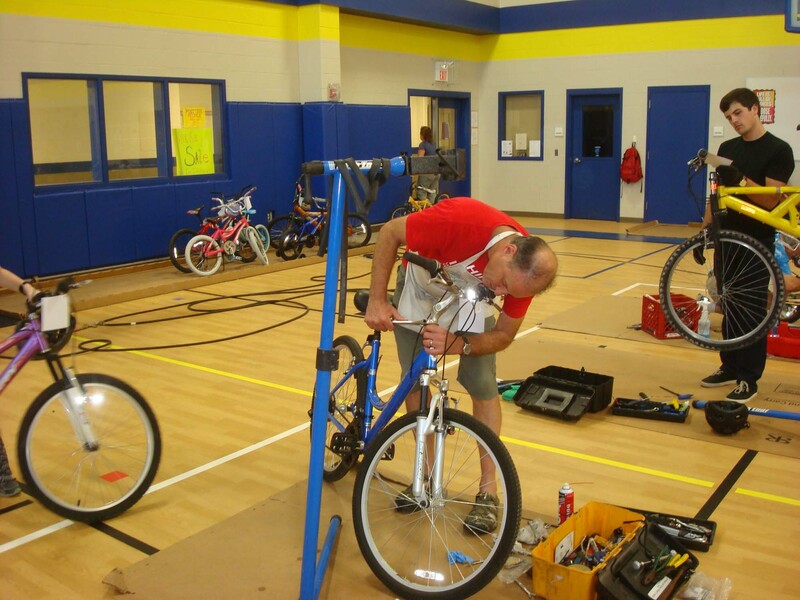 The Hallsburg Elementary School Bicycle Safety Event will be held on April 3 & 4. from 4 to 8 pm. This is an event that the WBC has been a part of for the last 7 years. 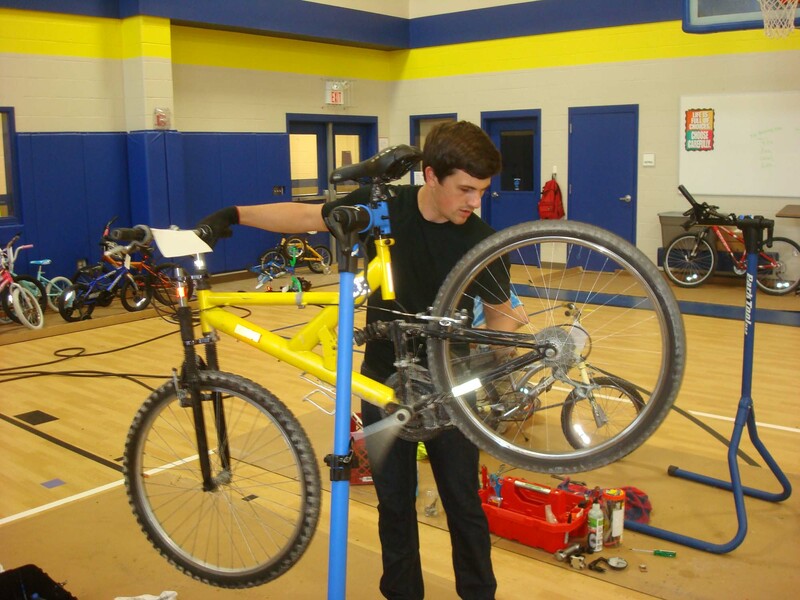 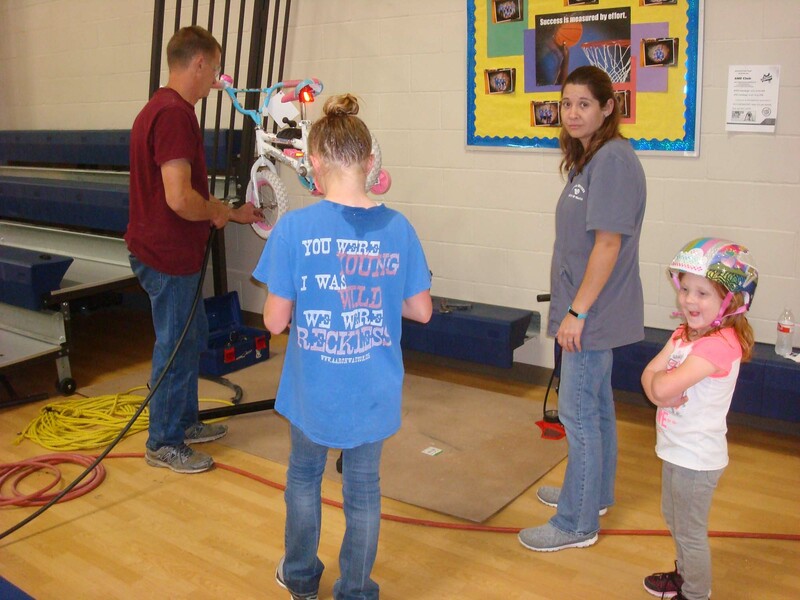 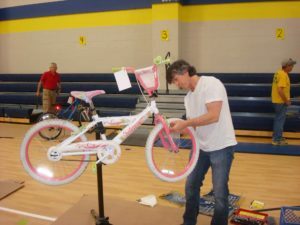 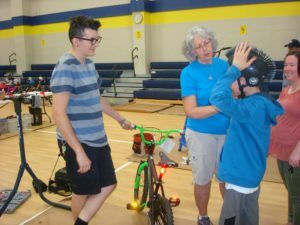 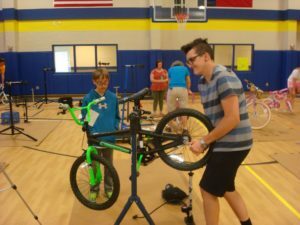 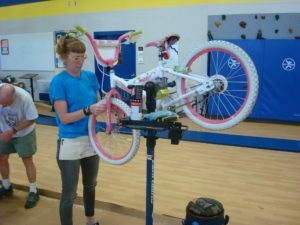 As part of the school’s safety program, they teach students proper bicycle safety by reviewing road rules, proper helmet fit, hand signals and bicycle maintenance. The WBC helps out to make sure the bicycles are safe to ride. See the pics from 2017 and event report from Rusty at the bottom of this post. 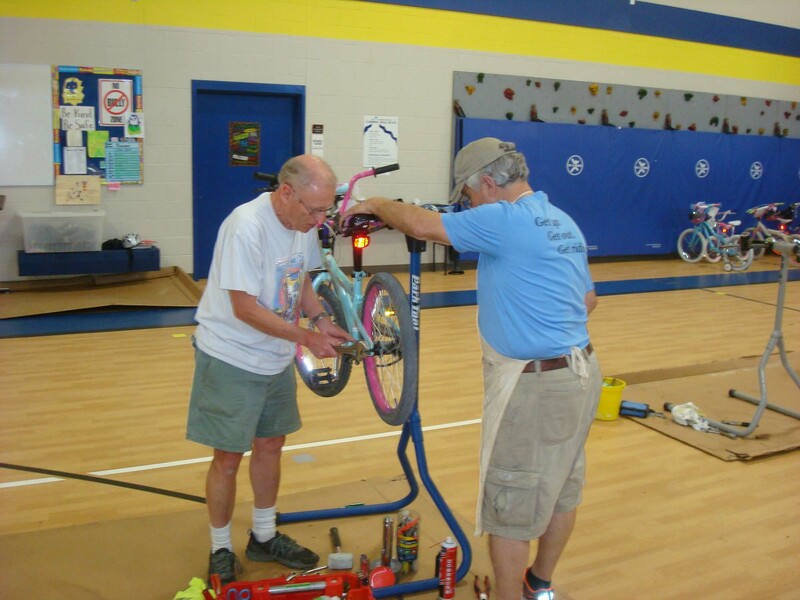 You do not have to be an expert bicycle mechanic to participate. 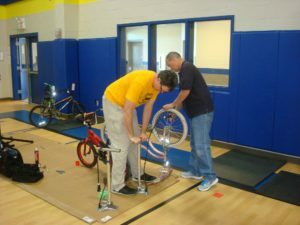 We need all the help we can get as we typically have about 120 bikes to evaluate and fix what we can. 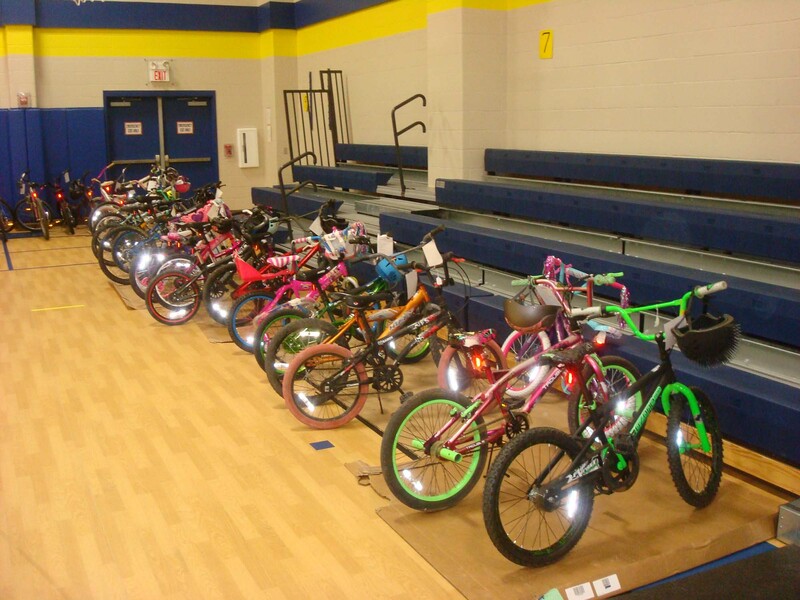 The school will provide a light meal. 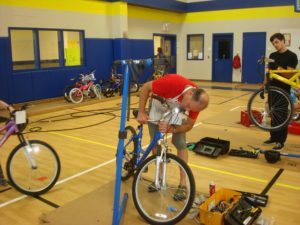 We need WBC members that can help out to sign up. 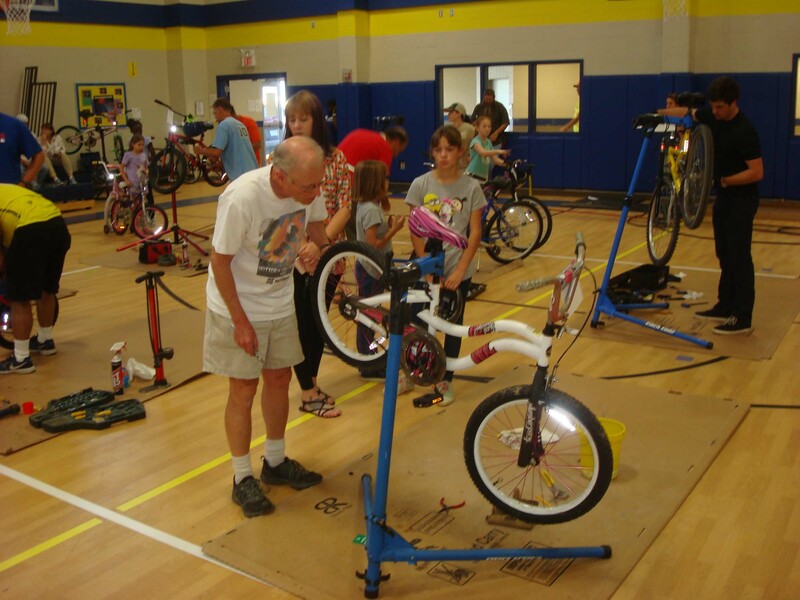 Let us know what days you can participate and the approximate time you can be there. Rusty will be at the school at 2:00 to start setting up. 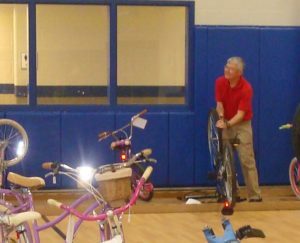 If any of you can come early, please let us know. 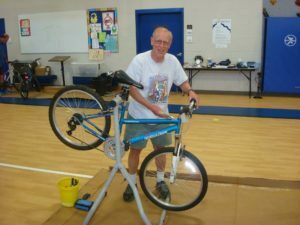 If you have them, bring a repair stand, floor pump, and bicycle tools. 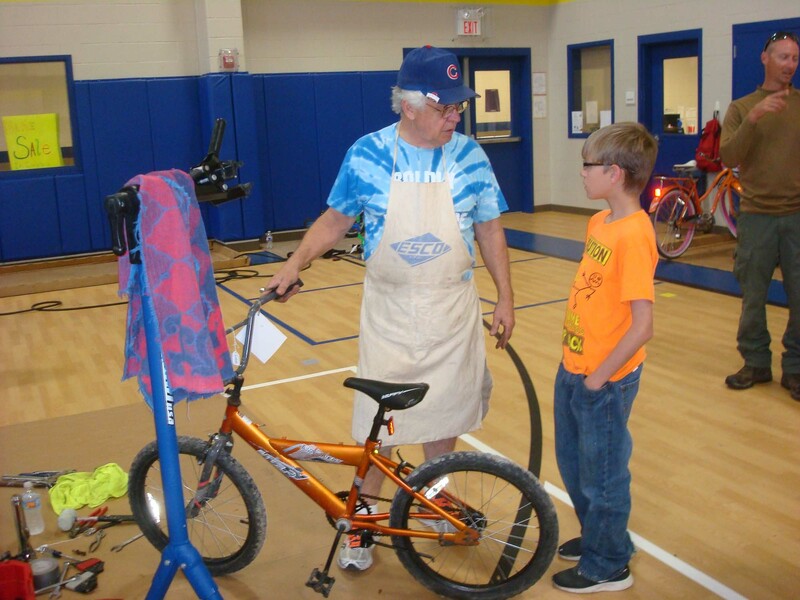 It’s handy to bring an apron and a rag. 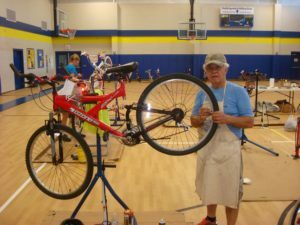 The WBC will have an assortment of bike tubes, chain lube, brake and chain cables and housings, universal brake pads, handle bar grips, and bar end plugs. We will also have tools you can use. 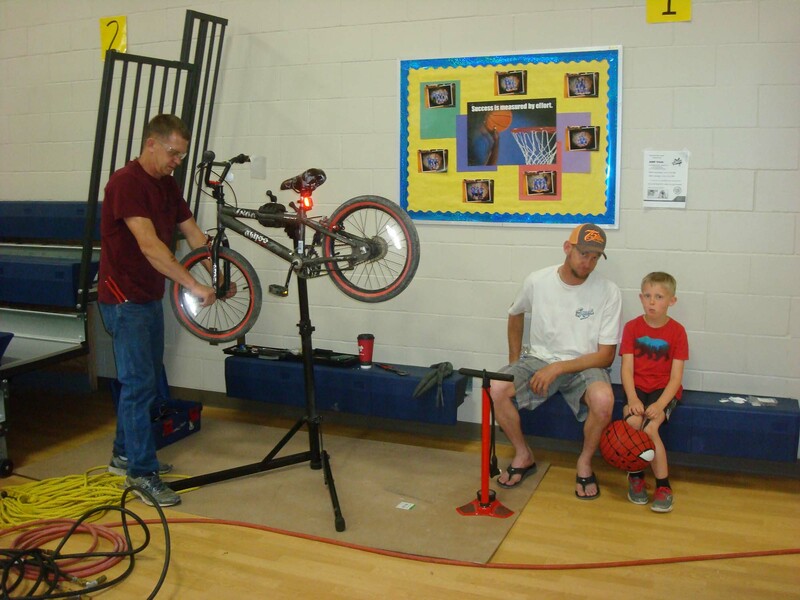 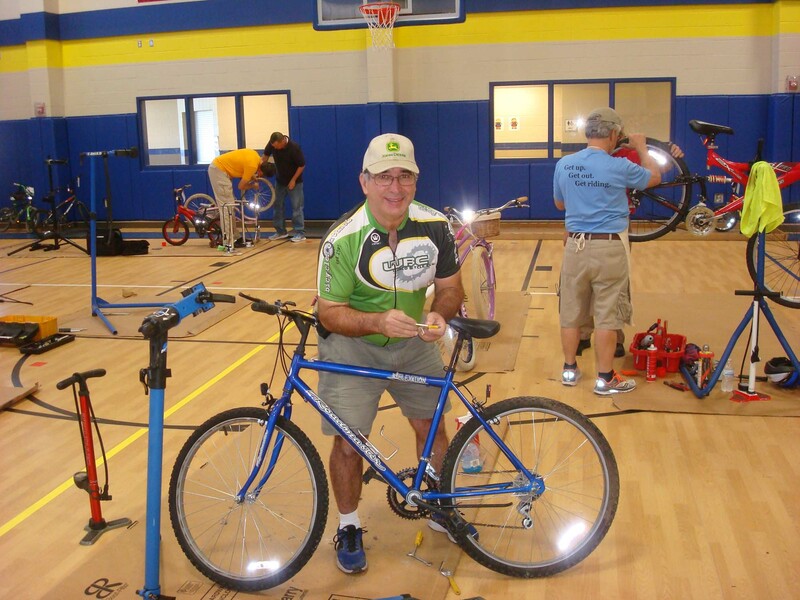 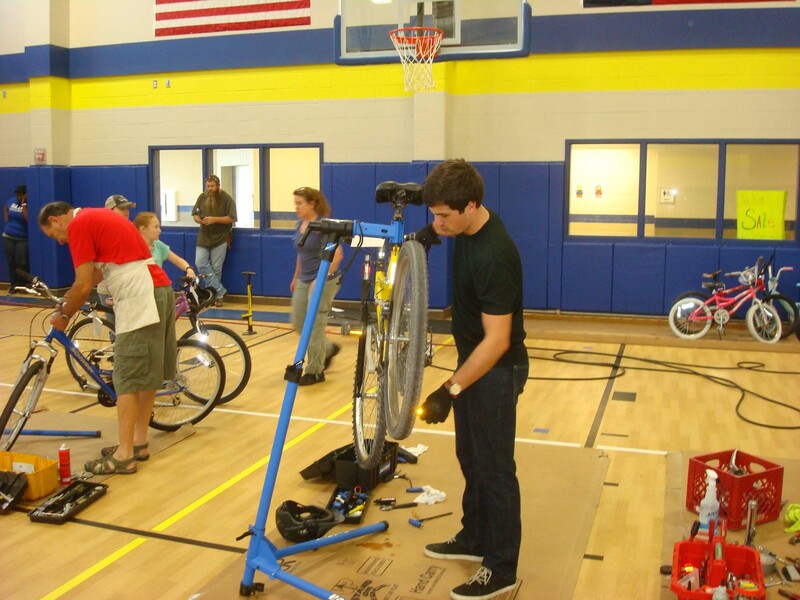 Many thanks to everyone who participated in this years Hallsburg bicycle safety event. We reached a new record of inspecting and repairing 166 bikes! 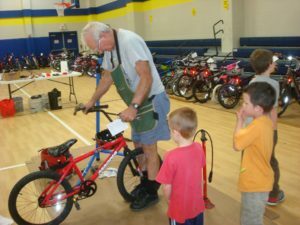 Every year proves to have a few surprises. 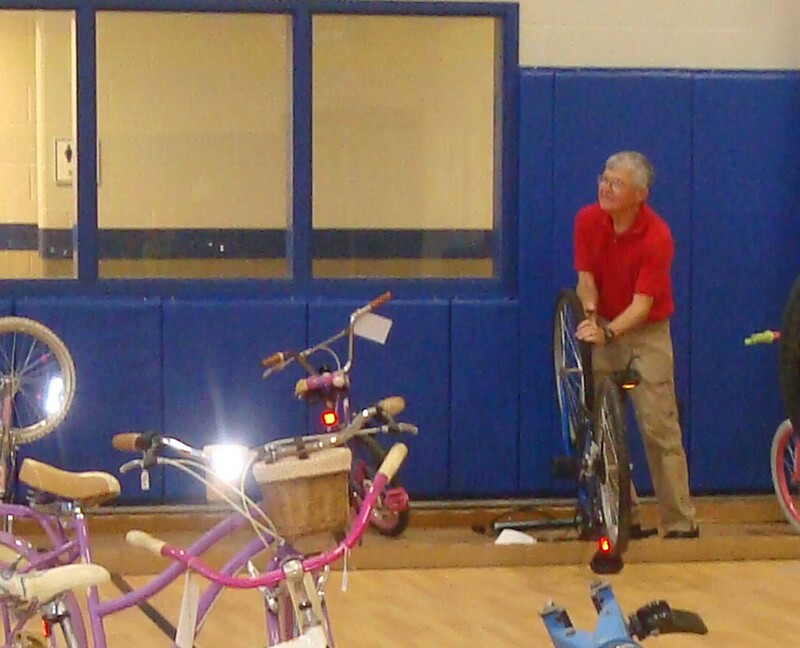 There are always bikes with no working brakes, shiftless drive trains, missing reflectors, and loose kick stands. 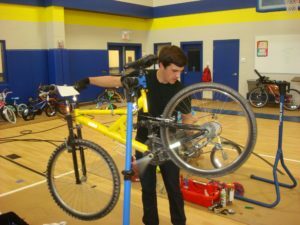 This was the first time we had a bike with 22 holes in a tube, a bike so muddy you could not see what color it was, a bike with wasp nests on it, and one with brakes pads upside down. 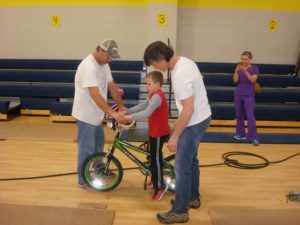 Our crew did a fantastic job and was greatly appreciated by parents, students, Hallsburg staff and Athletic Director, Carolyn Scott. 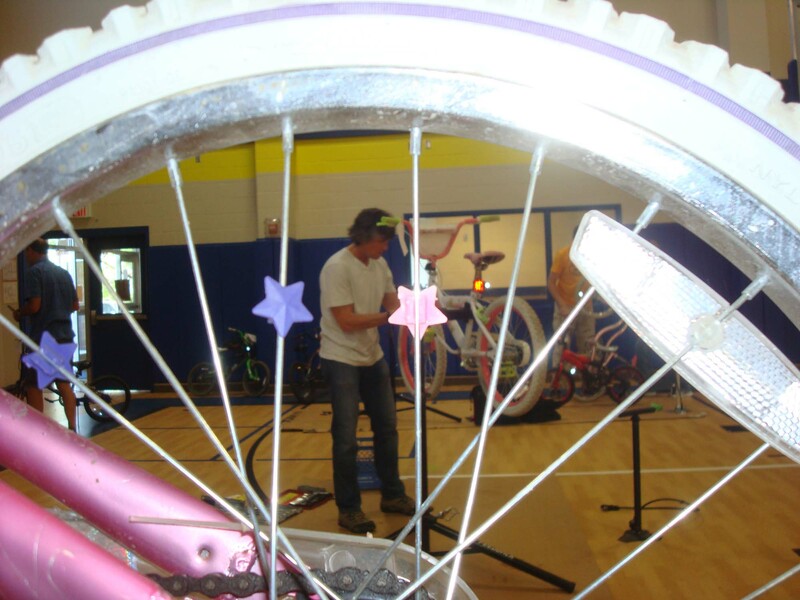 Thanks also goes to the Bicycle World for providing repair parts at a deep discount to the WBC and to Bear Mountain for allowing me to rummage through their reflector stash. Attached are pictures from the event. I think I got pictures of everyone working on the bikes except Valeri Smith but I assure you I saw her in action. 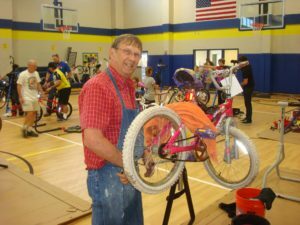 John and Saundra Karnes would have been there but John sliced a finger to the bone when bringing a repair stand into the school and had to leave to get about 16 stitches. 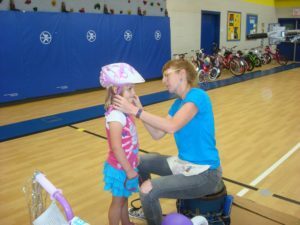 Again, Thanks for supporting this great event to make bicycles safe for so many kids. 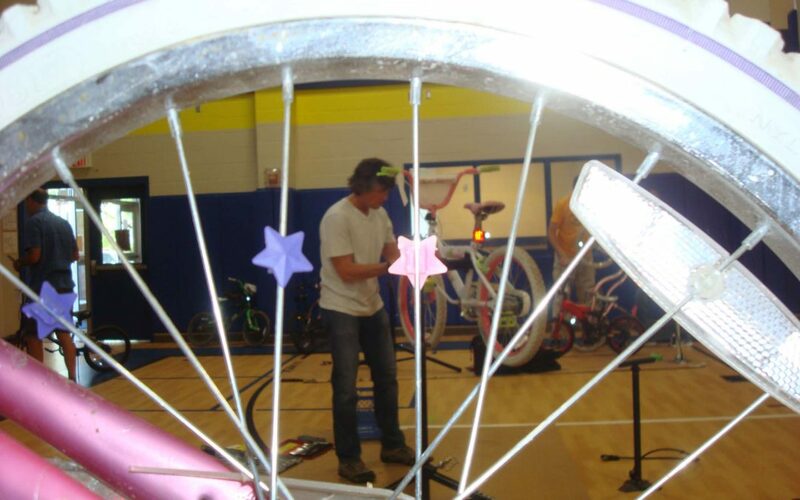 I cannot begin to thank you enough for the generosity of your time and talents (and bike parts and the list goes on). 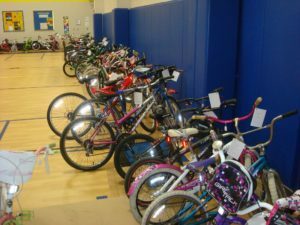 It is so important to get kids outside playing and exercising, and bikes have always been a favorite. As you noticed however, they are not always in the safest condition. I don’t think you can quantify how many bumps and bruises and possibly tragic accidents you proactively prevented with your attention this past Monday and Tuesday evening. Of even greater importance for some of our students, they connected with an adult who cared enough about them to work on their bike, and talk to them, and give them some attention, letting them know they are important. 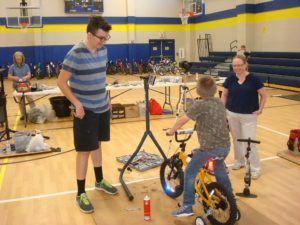 You can’t put a price on that, and it’s pretty difficult to see it in data, but nevertheless, you made a difference to a child. That’s what keeps me coming back to school every day.